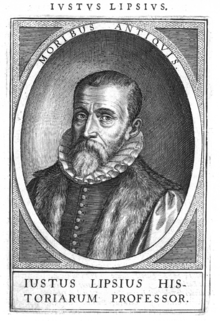 Neostoicism was founded by Flemish humanist Justus Lipsius (1547 – 1606), who in 1584 presented its rules, expounded in his book De constantia (On Constancy), as a dialogue between Lipsius and his friend Charles de Langhe. In the dialogue, Lipsius and de Langhe explore aspects of contemporary political predicaments, by reference to the classical Greek and pagan Stoicism, in particular as found in the Latin writings of Seneca. He further developed Neostoicism in his treatises Manuductionis ad stoicam philosophiam (Introduction to the Stoic Philosophy) and Physiologia stoicorum (Physics of the Stoics), both published in 1604. Neostoicism is a practical philosophy which holds that the basic rule of good life is that the human should not yield to the passions, but submit to God. Neostoicism recognizes four passions: greed, joy, fear and sorrow. Although the human has the free will, everything that happens (even if it is wrong because of the human) is under control of God and finally it tends to the good. The human who complies with this rule is free, because he is not overcome by the instincts. He is also calm, because all the material pleasures and sufferings are irrelevant for him. Finally, he is really, spiritually happy, because he lives close to God. Neostoicism had a direct influence on many seventeenth and eighteenth-century writers including Montesquieu, Bossuet, Francis Bacon, Joseph Hall, Francisco de Quevedo and Juan de Vera y Figueroa. The work of Guillaume du Vair, Traité de la Constance (1594), was another important influence in the Neostoicism movement, but while Lipsius based his Stoicism on the writings of Seneca, du Vair emphasised the Stoic thought of Epictetus. The painter Peter Paul Rubens was a disciple and friend of Lipsius, and there is a painting made by Rubens, now in the Pitti Palace showing Rubens standing next to Lipsius as he teaches two students who are seated in front of him. This page is based on the Wikipedia article Neostoicism; it is used under the Creative Commons Attribution-ShareAlike 3.0 Unported License (CC-BY-SA). You may redistribute it, verbatim or modified, providing that you comply with the terms of the CC-BY-SA.